I mean, have you seen these guys? "A Better Deal: Better Skills, Better Jobs, Better Wages"
So okay, it has a subtle reference to Franklin Roosevelt's New Deal, and the message, as Bill Clinton might have said, focuses on the economy like a laser beam. So far, so good - or, so better. Well, what's not to like? Quite a few things, actually. For one thing, the slogan doesn't tell us how Democrats are going to provide a better job market. Doing something about income inequality would be nice, but the Democrats can't say anything that would offend their Wall Street backers, even though they've lost most of them to Donald Trump. Second, it doesn't tell us what kind of superior jobs the Democrats want to provide. Maybe jobs building and running a modern national passenger railroad? Maybe bringing manufacturing jobs back from China? Who knows? Thirdly, it doesn't say how they plan to provide the skills; maybe bring Gary Hart's "Strategic Investments" policy proposal from the eighties out of cold storage? More likely, they expect you to figure out how to get the skills, which sounds like a Republican proposal. Fourth, the slogan only mentions economic issues and doesn't say diddly-squat about quality-of-life issues - nothing about schools, no mention of climate change, and no stand on gun control. And oh yeah, no mention of the issue that the Republicans have forced us to face - the fate of the health care system. But the last and most damning flaw of this slogan is its comparative-degree language. 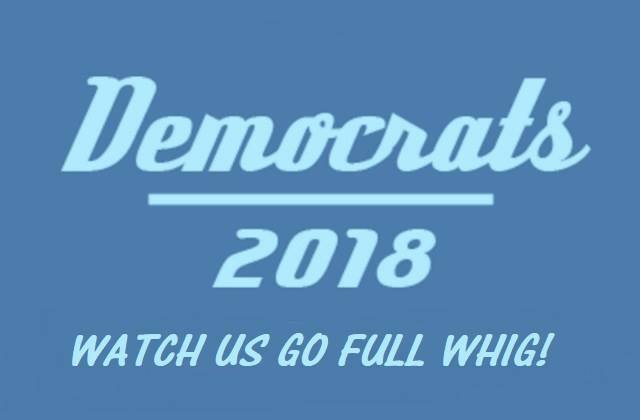 The slogan doesn't say that the Democrats can provide a superb or an excellent economic program, or even a good one - only a better one. Better than what? The Republican economic program? Well, yes, the Democratic economic program is better, I guess. Providing hundreds of thousands of dead-end jobs is better than providing tens of thousands of dead-end jobs. A modest tax increase on the wealthy is better than a tax cut for the wealthy. And Cleopatra was a better movie than Heaven's Gate. The simple truth is that while Republicans haven't exactly set the bar very high, neither have the Democrats. Both the Clinton and Obama administrations improved the economy, but many people were still left out, and the fact that the Republicans controlled the House of Representatives for six of the eight years of each of Clinton's and Obama's two terms in office only goes so far to excuse both men. Clinton was instrumental in repealing the Glass-Steagall Act separating investment and commercial banking, and Obama did nothing to prosecute the bankers who took advantage of the law's repeal and caused the Wall Street financial crisis of 2008. Simply being better isn't enough. This slogan was supposed to have been worked out with a Bernie Sanders supporter, but it sounds a lot like the banter of then-Virginia governor and now U.S. 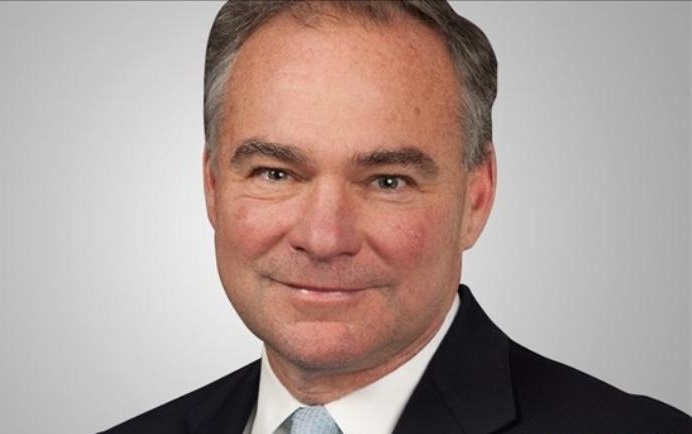 Senator (and 2016 Democratic vice presidential nominee) Tim Kaine, below, in his official Democratic response to President George Walker Bush's 2006 State of the Union address. "Voters want better skills, and better jobs, and better wages. (And better health care, and a stronger social safety net, and a fairer tax system, and so on and so forth.) But the party desperately needs to decide which policies it plans to support in order [to] effectuate these outcomes, even if some of the more tantalizing possibilities - single-payer health care or a federal minimum wage hike or whatever - are more aspirational at this particular moment in history than anything else." Incidentally, this new slogan from the Democrats led many folks to compare it (unfavorably) with a similar slogan from Papa John's Pizza: "Better Ingredients, Better Pizza." Which is ironic, since Papa John's founder John Schnatter built his empire on paying his employees low wages and used his millions to build himself a mansion in California so colossal that even William Randolph Hearst would have scoffed at its opulence. 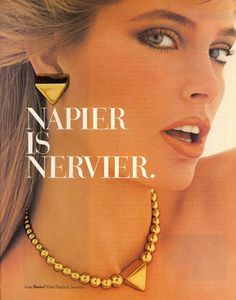 The slogan recalled for me the use of comparative-degree words in those old Napier costume jewelry ads, as the Democrats' promises are just as authentic and as serious as costume jewelry. 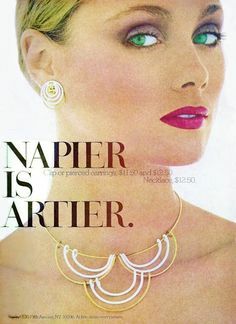 But at least the comparative-degree adjectives in those old Napier ads had a purpose - to ensure the correct pronunciation of the brand name. And at least those Napier ads featured hot models like Kelly Emberg (above) and Jane Hitchcock. 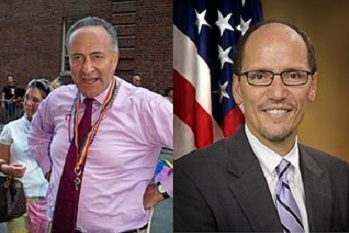 All the Democrats have to offer are Charles Schumer and Tom Perez. And they're not exactly GQ material. The voters are not stupid. They know that there's something better. But they don't see anything out there that's good. And if the Democrats need another slogan in the near future, perhaps they can consider this one . . .